Before beginning the craft, you may wish to give your students a brief background about angels and why they are often seen at Christmas time. The word “angel” comes from a Greek word meaning “messenger.” A messenger is someone or something that carries a message – a type of communication that is either written or spoken. In the Bible, angels are the messengers of God. At Christmas time, angels are popular because it was angels who brought the news of the birth of Jesus. The angel Gabriel brought the news to Mary that she was going to have a baby, and that baby would be the son of God. Another angel spoke to Joseph and told him that he should marry Mary and look after the Christ child. It was also an angel who appeared to the shepherds at Bethlehem to tell them that baby Jesus had been born! An interesting story you may wish to incorporate into the lesson is Thank You, Angels, by Doreen Virtue. In this book, the author introduces children to angels by showing the reader how angels can be of help, how to recognize an angel’s voice, and what signs angels may use to let us know they are around. Using the white paint and paintbrush, paint each student’s hands white. Have them lay their hands in the middle of the blue construction paper with their wrists together. (See photo) This will create the angel’s “wings.” Let dry. Glue the green construction paper along the bottom of the blue construction paper. This will serve as the grass for your angel paper craft. Using the white construction paper and pencil, trace each child’s foot. Cut out with scissors and glue in between the two white hand prints. This will be the angel’s body. Cut out the head shot of the child, and glue over the heel of the foot cut-out. Allow the children to add the moon and star shapes to the rest of their picture. Using the blue pipe cleaner, fashion a hanger at the top of the picture. 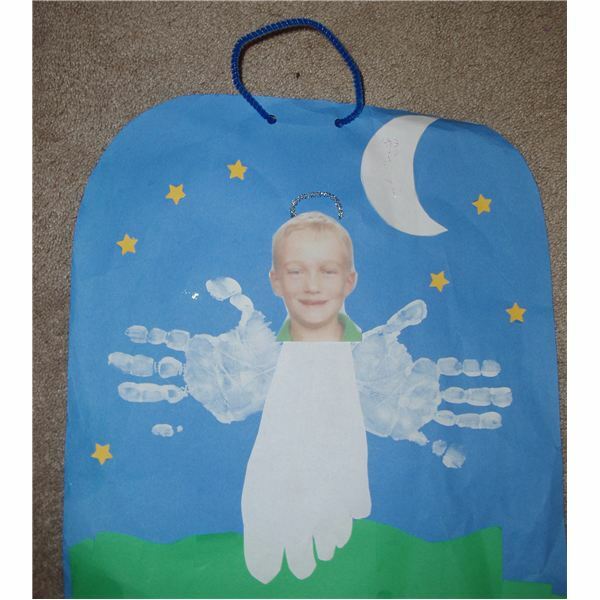 Parents will love this keepsake featuring their own little angel’s feet, hands and face!